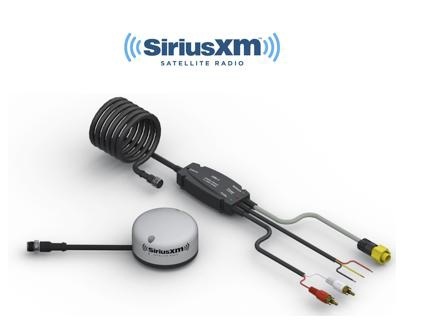 Compatible with all Simrad NSS, NSE and NSO Multifunction Displays, as well as B&G Zeus and Zeus Touch navigational systems, the new Simrad and B&G WM-3 SiriusXM™ Satellite Weather & Radio Module is compatible with SiriusXM?s new North America equatorial Satellite System, while ensuring future feature expandability. Easy to install with up to 99-feet of total cable length plus a compact housing and splitter, the WM-3 is network-controlled through high-speed Ethernet with a built-in dual RCA male audio cable for direct connections to the SonicHub™ entertainment system or virtually any marine stereo. Real-time SiriusXM Marine weather information delivered to your Simrad NS or B&G Zeus display; up to 200 miles offshore and 100 percent of US Inland areas. Weather overlay onto chart allows you to see important cartography detail along with weather data. Detailed NOAA Marine Zone forecasts and surface buoy reports let you know the conditions offshore before you leave the dock. Monitor storm cells with live NOWRadTM and Canadian weather radar information on your chart. Sea Surface temperature/chart overlay will lead you directly to temperature breaks and eddies to find the most productive fishing spots. Expanded audio selections with up to 220 channels of SiriusXMTM radio programming controlled from your MFD. Accurate roadside fuel prices assure savings at the pump. Plug-and-play installation using innovative splitter with four high-bright LEDs that show power (12-24Vdc), network activity, antenna faults and audio sequences. Easy pole or deck mounting with all hardware included.